My hair story is an open book. I color it, cut it in crazy layers, style it using all sorts of styling tools and even go on an annual rebond session --- yes, beautiful hair needs a lot of work for me, so if you have insanely beautiful hair without having to spend or do anything --- drop down on your knees and thank the hair heavens! As early as Freshman High, I knew that I wanted healthy hair because it is naturally dry, frizzy and "poufy". I envy my sister's long, straight, shiny hair and wondered how sisters can have such different hair genes! 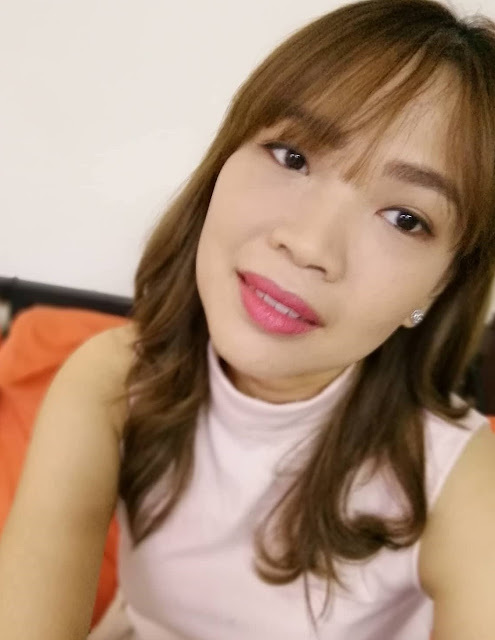 I have experimented a lot of hair color for the past years and I realized that my hair has been going through all those stress, it doesn't grow as fast as it did several years back. 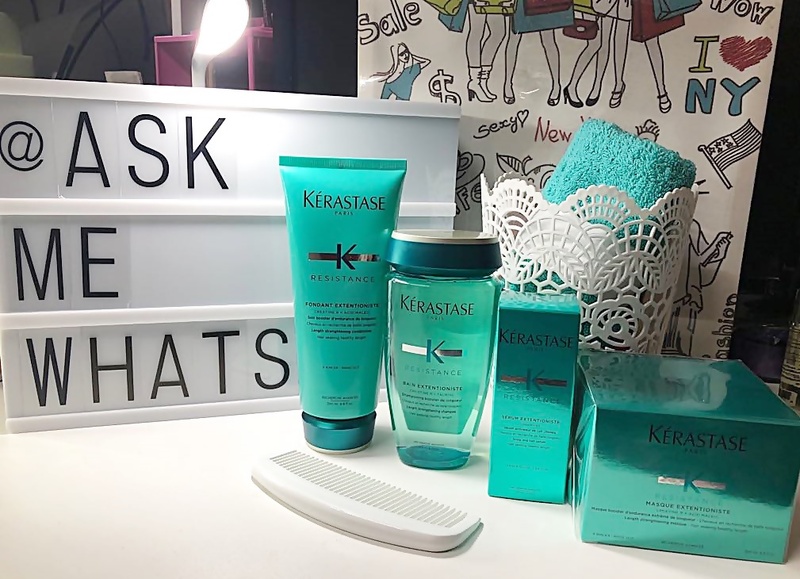 So it was perfect timing when Kerastase launched their Kerastase Resistance Extentioniste range. This is the first hair program designed to optimize and reinforce the length of damaged hair. Bain Extentioniste (Php1,600.00) - This is the first step in hair care program. This length boosting shampoo contains Creatine R Complex, which protects the hair follicle, Bain Extentioniste ensures a healthy and stimulated scalp environment. Fondant Extentioniste (Php1,900.00) - Can be used daily after Bain Extentioniste. This product is a powerful detangling product with lightweight nourishment from root to tips. Aside from Creatine R Complex, this is also enriched with Acid Maleic. The miniscule particles penetrate the hair fiber and seal the cuticles with an even coating from roots to tips. Masque Extentioniste (Php2,980.00) - This product is a masque that helps prevent breakage and reduce the appearance of split ends. This product is also enriched with Creatine R Complex and Acid Maleic. How to use? This product can be used twice or thrice a week. To leave on towel-dried hair for 5-10 minutes then rinse. Serum Extentioniste (Php2,050.00) - This is a serum product that helps restore roots and hair cuticles and protect hair fiber. Enhanced with ceramides that act on superficial damage level. This is a no-rinse product and can be applied once or twice a week to your scalp by applying 3 pipettes along the scalp and massage using circular motion. Kerastase Resistance Extentioniste is available in Kerastase Partner salons - Basement, Bench Fix, David's Salon, Emphasis Salon, Essensuals, Jesi Mendez, Regine's, Rever Pacific Star, Studio Fix, Tand G Premiere Salon and Teng Roma S Maison. 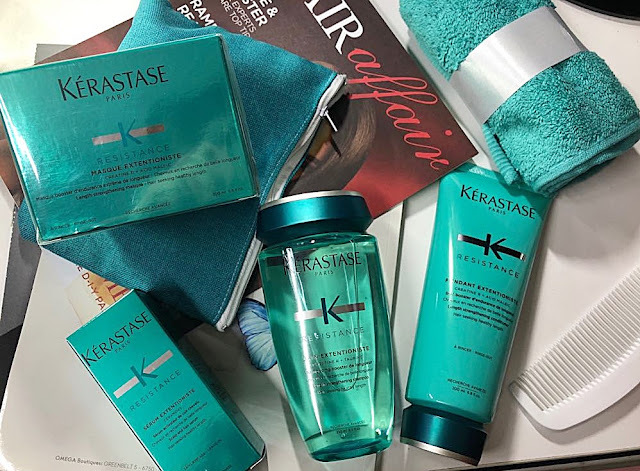 Have you tried Kerastase products? I never knew kerastase is pricey...I got them as pasalubong. Despite the price it works real great.